Perricone MD Face Finishing Moisturizer 59ml is a, lightweight, hydrating facial moisturiser, formulated with powerful antioxidants to help firm skin's appearance and minimise fine lines and wrinkles. With a rich texture that makes the cream ideal as a makeup primer, the face finishing moisturiser instantly brightens your skin whilst smoothing fine line and wrinkles so that your complexion looks dewy and radiant. The moisturiser contains 3 powerful anti-ageing ingredients; Alpha Lipoic Acid, DMAE and Vitamin C Ester. Vitamin C Ester helps to brighten and clarify your skin whilst DMAE firms and Alpha Lipoic Acid tackles fine lines and wrinkles. 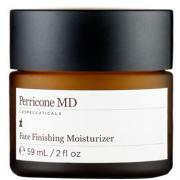 Perricone MD Face Finishing Moisturizer 59ml was found on 2 websites and was price compared using EAN: 0651473510901. The cheapest Perricone MD Face Finishing Moisturizer 59ml is shown as the main item, prices range from £59.00 to £59.00, excluding delivery. Price comparison based on price and delivery charges, with any valid discount codes being applied, is shown in the table above. Prices and information correct at the time of publication.